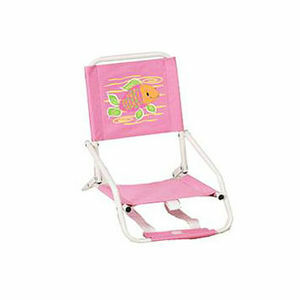 The recalled children's beach chairs have exposed, sharp metal rivets, posing a laceration hazard. The firm is aware of one injury to a 21-month-old girl who fell on the chair's metal rivets and cut her forehead and had to have stitches. This recall involves about 15,400 children's folding beach chairs with white aluminum tube frames and pink, yellow, blue, or purple fabric seats and chair backs with fish, palm trees, or mermaid decorations.The chairs measure 13 inches wide by 18 inches high by 20 inches deep. Home Goods and other stores nationwide from June 2011 through June 2012 for between $13 and $25. Stop using the recalled beach chairs immediately and return them to Downeast Concepts for a full refund. For additional information, contact Downeast Concepts at (800) 343-2424 between 8:30 a.m. through 5 p.m. ET Monday through Thursday and between 8 a.m. and 4:30 p.m. on Friday, or visit the firm's website at www.downeastconcepts.com.